Nursing student Sabrina Ffrench won a community nursing award from the Cavell Nurses’ Trust in June. She talks to Lynne Pearce about the award and why students should make the most of their opportunities. 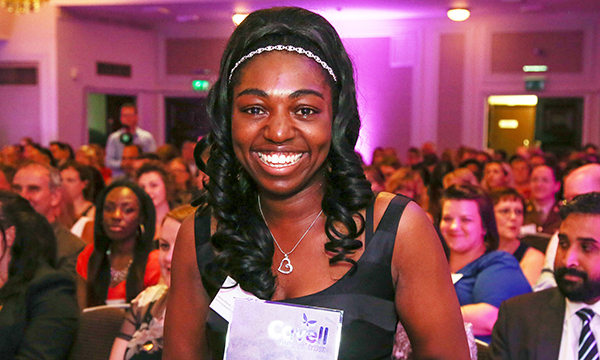 For nursing student Sabrina Ffrench, winning a scholarship at the Cavell Nurses’ Trust awards in June came as a bolt from the blue. ‘I’d forgotten I’d entered,’ admits Ms Ffrench, who has just completed her degree in adult nursing at Wolverhampton University and is waiting to start her first job in surgical nursing. ‘I didn’t expect to win at all. When they called my name it was a shock,’ she says. The scholarship scheme recognises and celebrates nursing and midwifery students from across the UK. Awards include outstanding academic achievement, outstanding student midwife and nursing student, and leadership. Selected from two dozen candidates, Ms Ffrench won the community nursing award, which recognises students who put the community at the heart of everything they do. Candidates were asked to describe how they showed outstanding community care in a personal statement of 500 to 1,000 words. This demonstrated an ability to judge the needs of the community, drive projects or initiatives, a creative approach to problem-solving and good clinical skills. In Ms Ffrench’s case, it involved working with children with autism and other learning disabilities, including helping on trips and social events, and participating in various charity fundraising activities. Ms Ffrench’s award of a £1,500 travel scholarship can be used for a placement either abroad or in the UK. She would like to go overseas to broaden her experience, and hopes to do something within the field of learning disabilities that helps raise awareness. She advises other nursing students to make the most of any opportunities that may arise. ‘As a student, I’ve always been open to different challenges and taking part in extracurricular activities. The Cavell Nurses’ Trust supports nurses, midwives and healthcare assistants when they face hardship. Click here to find out more.